We all know that the secret to getting things done is great prioritisation, but sometimes it feels like that is easier said than done. When your to-do list is in danger of becoming a novel, and it seems like you have a million and one things to get done by the end of the day just how do you cope? 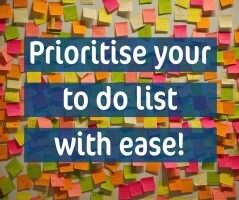 You need to prioritise your tasks, of course! Number one on my well organised planner today is to share some of my workload prioritisation strategies with you – because what I really love doing is helping others to work smarter…not harder! Now, when you have your own business you’ll often get taught to think outside of the box but on this occasion I’m going to ask you to think firmly inside the box, in order to prioritise your tasks. And it’s not just any old box – oh no! This is a great little box that’s really going to help you get organised and understand what you need to do to be effective, efficient and feel in control of your workload. OK, I won’t keep you in suspense any longer! Our clever box is called an Eisenhower Box. It’s named after the U.S. President as it was reputedly used by him to help him manage his priorities and get things done that needed doing (and of course as the American President he was a rather busy man). The Eisenhower Box is made up of 4 quadrants – as you can see in the diagram below. So ask yourself these questions, fill in the grid and we’ll talk about what each area means and how you can use them. OK, so this is work that really needs to be done! If you don’t get your important and urgent work completed then you could end up losing business and we don’t want that. This box should be the priority each day. Set a dedicated time of the day to get things done and give yourself strict deadlines – you could even promise yourself a treat after each job to encourage you to get them finished. It’s a great feeling when the tasks in this box are all ticked off and getting them done quickly and efficiently will mean that you don’t have these jobs hanging over you every day! These are the tasks you should do, they are your highest priorities. 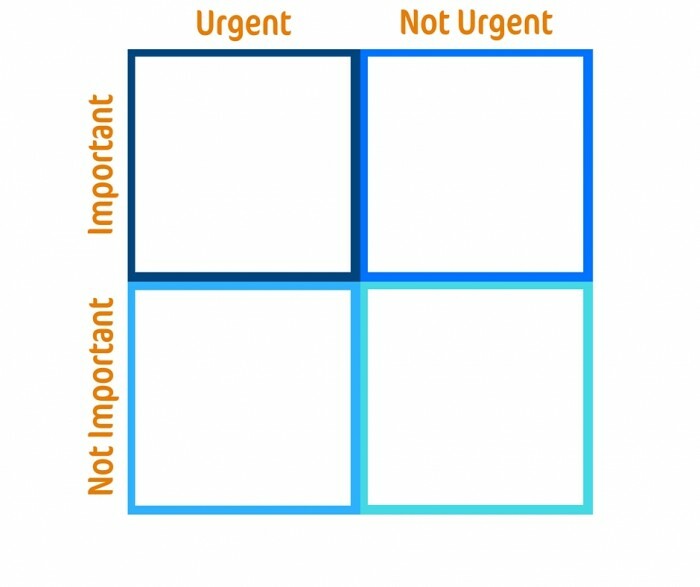 This is a bit of a dangerous quadrant as all the tasks languishing here are the ones that actually add value to your business but you just never seem to have the time to do them! It could be that you want to re-vamp your social media pages or book some additional training but because it’s not a priority it just never seems to get done. It’s really vital to allocate some time each day to this box as otherwise your list will keep getting longer and longer! It can be a good idea to get these jobs done first thing in the morning before the urgent and important stuff takes over. Allocate a set amount of time each day to work on the tasks in this box and you will see a real benefit to your business. These tasks, you should defer, they are not top priority but do schedule some time in to complete them. This is a box where you need to be really strong willed otherwise you risk spending time on things that need doing, but are not really adding that much value to your business. These are often administrative tasks and I feel that the jobs in this quadrant are perfect for delegating to a virtual assistant who will be able to get them done quickly and efficiently for you – whilst you get on with the important work of running your business! As mentioned, you should look to delegate anything in this section, as these tasks might not be a good use of your time. If a task falls into this box then you really need to have a serious think about whether it has a place on your to do list or whether it needs to be removed altogether. It’s actually a great box for making you stop and think about what you are taking on in your life and assessing whether you have put in on your list because you feel you ought to be doing it, or because you actually need or want to be doing it. Anything here you can usually dump. If you don’t think it’s right to dump it off your list altogether, you could either re-prioritise it by putting it in another quadrant (only if it really does need moving), or add it to an ongoing ‘wish list’ which is separate from your to-do list – things you’d like to do at some point but not actionable right now. So now you understand how to use your prioritisation grid you can really put it to work! Why not take 20 minutes at the end of each day to plan your priorities for tomorrow so you can wake up organised and ready to go! Don’t worry if it takes a bit of time to get used to as it can often be hard to work out your priorities. However over time you will find that it makes a real difference to the way that you work. You’ll feel on top of your workload and will have time to work on the tasks that really matter to your business. Working out where you should focus your efforts in the time you have available is what I do, so get in touch and let’s get you being super productive!